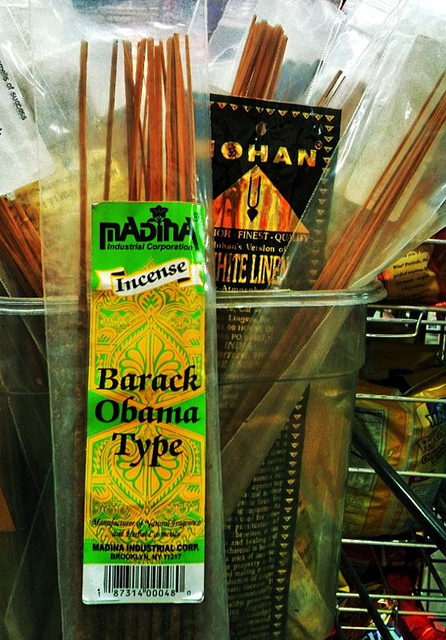 My friend Funlayo spotted incense like the Barack Obama Type (pictured above) in the Harvard Square T-stop and I knew I had to smell it (and maybe pick some up to burn today for luck). But incense-man has been out of the office every time I've popped into the station, and I suppose I'll have to wait until after President Obama is re-elected (knock on all the wood) to burn this in celebration rather than to mask the smells of full-court stress. American readers, don't forget to sniff your fellow progressive citizens at the polls today & VOTE!